He may have been safe. I’ve watched the replay of Michael McKenry’s attempted tag on Julio Lugo about 30 times. Replays from different angles. Still photos. Reenactments performed by trained chipmunks. Consensus has it that McKenry’s swipe tag caught Lugo on the leg well in front of home plate. 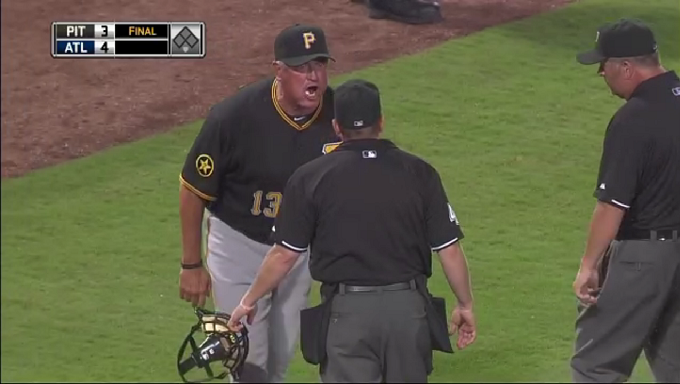 Given the Braves and Pirates had played six hours, 39 minutes and nearly 19 innings to that point, and that this game had major playoff implications for both teams, this was supposed to be a cruel, unjust, tragic way to end it. Worse than Jim Joyce’s blowing the call that cost Armando Galarraga his perfect game. Given the technology at the disposal of everyone on the planet except the four umpires on the field, this is supposed to be a final, nail-in-the-coffin example of why baseball so desperately needs instant replay. I don’t think it’s that obvious. If your aim is to use instant replay the way the NFL does, where a call can only be overturned if there’s incontrovertible evidence, this play certainly does not meet that burden. But even if you want to use replay to make a simple yes or no call, you won’t get unanimity. And no, the fact that Lugo acted as if he were out does not constitute iron-clad proof. That was the only incontrovertible element to the play: Even if Meals got the call right, one could argue he got it right for the wrong reason. Bad Jerry Meals. No cookie for you. There may be no one in the universe who has made more shrill arguments for enhanced technology in baseball — automated ball/strike calls, instant replay, tennis-style Hawk-Eye systems for fair/foul line calls — than I have. (See here, or here, or just ask my wife what I mumble about in my sleep.) I’ve long been ready to embrace our new robot overlords. That MLB commissioner Bud Selig and the umpires union — the people who actually matter in this debate — are not as ready is a source of daily frustration. The human element is a beautiful thing in baseball. But it’s the players who ought to provide it. The job of an umpire is to get the call right, and occasionally keep the peace. That’s it. Problem is, human beings can’t possibly get everything right. Poor Meals crouched behind home plate for hundreds of pitches last night. If he were a 21-year-old Olympic decathlete cycling Red Bull and HGH through his eyeballs, and not a 49-year-old who apparently enjoys Ron Swanson-esque pursuits in the offseason, he’d still get mentally and physically tired after nearly seven hours of calling a game. He’d still get the occasional ruling wrong. We want technology to satisfy our sense of right and wrong. But it would also make umpires’ jobs much easier. Hyperbole aside, I don’t want Meals gone. I just want him to succeed. The ending to last night’s game wasn’t the worst miscarriage of justice ever. It wasn’t worse than Joyce-Galarraga. And it wasn’t a textbook example of why baseball needs instant replay. It was an incredibly difficult play to call, one so tough that it would show how replay isn’t a perfect solution either. Still, you’ll see a lot less controversy the day baseball starts using the same tools we all have on our TVs … ON OUR F’ING PHONES! … to make calls.